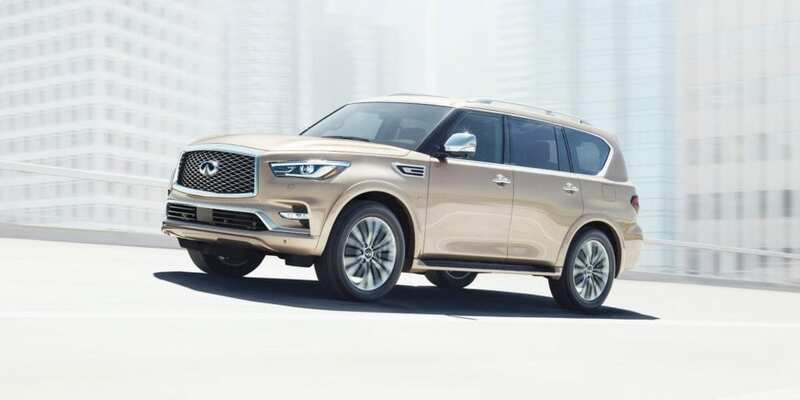 The stylish new Infiniti QX80 4WD combines elegance with sportiness features that offers drivers a sense of power and luxury. This sleek new SUV offers the world’s first Around View® Monitor (AVM) helps make parking easier. Four cameras positioned around the QX80 work with cutting-edge technology to build a virtual 360° bird’s eye view on your display. Moving Object Detection (MOD) alerts the driver to moving objects detected within the display image. When it comes to safety, the QX80 offers top-of-the-line features. The INFINITI Vehicle Immobilizer System embeds an encoded transponder chip into ignition key. The engine control computer will not allow the engine to start without the correct key and transponder. A peek inside and some of the many cool amenities include: 9 cup holders and 4 bottle holders; a front center console with a storage compartment and 12-volt power outlet; and there’s also a 12-power outlet in the cargo area. There’s also a battery saver that helps prevent accidental discharging if the electrical accessories are left on. Got something to tow? No problem. The QX80 can haul up to seven people and tow up to 8500 pounds. The Integrated Class IV tow hitch and 7-pin wiring harness with cover can get the job done.